After two 7-inches, ‘Maastunnel/Mt. Mitake’ and ‘Numa/Penarie’, Celer & Machinefabriek present the final single of the trilogy, ‘Hei/Sou’. These might very well be the most coherent, rounded off tracks by the duo so far. The artwork of the 250 numbered copies is again a collage of old Japanese postcards, and the single is accompanied with two beautiful (downloadable) videos by Marco Douma. Celer & Machinefabriek are having a great year. In addition to their separate releases, they’ve toured, released a download set of the tour, and completed a trilogy of fine vinyl singles, of which Hei/Sou is the final piece. Perhaps the most exciting thing about their collaboration is the extent to which each seems to have been inspired and invigorated by the presence of the other. By pushing each other into new territories, they’ve each upped the ante, as best demonstrated on Celer’s latest release for Somehow Recordings, Redness & Perplexity – a Celer recording that strikes out into bolder and weirder fields. In order for artists to stay relevant, they must continue to evolve, and that’s exactly what we’ve been hearing here. Take “Hei” for example. The opening portion doesn’t sound like either Celer or Machinefabriek, but the work of some new melodic, beat-driven producer. After setting the pace with hi-hats, the duo introduces a synth warble and a drone – elements of their individual productions that seldom appear together. It’s a bold statement, a confident, in-your-face opening that proclaims, “We’re not what you expect.” Eighty seconds in, the entire song shifts to the ambient spectrum, while preserving hints of the opening in the extended support notes. The louder elements are mixed softly, while the softer elements are mixed loudly, further inverting the listener’s expectations. When the percussion returns, it seems less a declaration than a gentle reminder. “Sou” rests in more familiar territory, but the melodic impulses remain, making Hei/Sou the most immediate of the three vinyl singles. The piece opens with a sound that rests somewhere between backward masking and morse code, leading to a glistening center of cycling tones. Volume is once again a noticeable tool, as the primary pattern rises and retreats, trading places with the similarly active drone. Few artists toy with internal volume so effectively; “Sou” reminds the listener that knobs can be just as important as notes. Those who purchase the release will also be given access to two videos by Marco Douma, completing the 2012 triptych. A box set would seem a distinct possibility, but at the very least, we hope these fine artists will continue to work together in the years to come. I’m rather late with my review, but here it is, the final installment of the transatlantic EP triptych created by Ambient musicians Will Long aka Celer who is usually hailing from either Huntington Beach, California, or Tokyo, and Rotterdam-based designer and Ambient fellow Rutger Zuydervelt aka Machinefabriek, who also gave me the opportunity to write this review by providing a digital copy. After the 7″ outputs Maastunnel/Mt. Mitake and Numa/Penarie, the duo returns for their final release, at least for the time being, as I cannot and won’t imagine an ultimate music-related farewell. The two compositions Hei and Sou unsurprisingly make up the Hei/Sou 7″ and are accompanied by two meandering, ever so slowly evolving and morphing music videos by Marco Douma. The vinyl is packed in Zuydervelt’s aesthetically gorgeous montage of Far Eastern postcards whose multiple, positively kitschy landmarks are beautifully layered; even if I just look at the pixels, I bathe in retro rivers. It’s no secret that I’m a big fan of Exotica music and the colorful U.S. postcard designs of the 50’s and 60’s, so the artwork does probably speak a lot more to me than anyone else, although its lushness is obvious from the get-go, right after the first glimpse. And look at my header image and the contours of that mountain, and then back to the same mountain on the Hei/Sou artwork – zing! What counts at the end of the day, however, is the music, and Celer & Machinefabriek don’t disappoint with the last part of their EP series. The settings are humble enough: Hei and Sou have the exact same length of 4 minutes and 48 seconds. Both can be heard in full at either the Hei/Sou section of Machinefabriek’s Bandcamp page or the duo’s Soundcloud page. Described on the latter page as “the most coherent, rounded off tracks by the duo so far,” let’s take a closer look at this auspicious remark by gazing at the ambience of both compositions. Hei launches with the electronic equivalent of a Chinese temple gong, although it’s not the darkly droning clang you’re probably having in mind, but the Glitch-infused gelid kind with quickly pulsating icy particles. These permanent, highly metallic eruptions are accompanied by both a 16-note loop full of oxymoronic quirky deepness and aquatic dryness as well as a majestically horn-like drone that seems to be released from far atop a mountain. The celestial ethereality of additional synth washes boosts the dreaminess of an otherwise lively setup chock-full of purposefully counterintuitive ingredients. It is only after about 90 seconds that a tranquilizing calm takes over, augmenting the rapture of the aural diorama. Glacial bells of an electric piano, fragile synth fragments and carefully stereo-panned static noises of the galactic kind altogether inject a cozy warmth through every pore of the arrangement, even though each sound would be frosty in its isolated form. It is this state of solemnity that makes Hei so grand. I link this very part to the cover artwork of the 7″ release. The music seems to depict this scenery, although I don’t know what was created first: the music or the montage of the front artwork. The electric piano droplets also seem to inherit a few tonalities and tone sequences that are typically linked to China from an Occidental point of view. This beautiful melody is further mollified with the help of bass drones. The thermal heat they’re providing works great in juxtaposition to the rising cymbals and the warped bird-resembling laser sounds. The song ends rather abruptly. It fades out properly, but once the listener has soaked in the phantasmagoria and peacefulness, Hei is closing the doors. It’s a terrific song, almost progressive in its development, although the term progression is quite problematic in music reviews, as it describes an obvious state of affairs in Ambient music. But I feel the need to use it nonetheless, all the more so as Celer & Machinefabriek have this song jam-packed with particles, pulses and fragments that would’ve made a great track of 10 minutes runtime. That Hei doesn’t even crack the five-minute-mark is sad, though not devastating. It paints a diverse yet harmonious aura, and it is only during the end that this gem feels a little bit rushed. Since the flow is so entrancing, one doesn’t want to leave. In short, Hei is a superbly mellifluous Ambient track that creates warmth through Glitch ingredients. Yep, you’ve read that correctly: warm Glitch particles. Soon to be patented? Sou is keen on the pulse side and keeps on residing in tropical territories. Using a weirdly chopped analogue loop as its point of departure which distantly reminds of phone dialing tones, soon enough an ecclesial synth mixture is added that comprises of traversing organ layers, a wandering Dub bass and a piercing high-region sparkle that coruscates organically. The warmth and inviting friendliness are incredible, and as if the duo wants to avoid a simple churchly Drone composition, Long and Zuydervelt add looped cascades of glittering bells whose plasticity and different phases remind ever so slightly on hooks and synth riffs used in House or Trance songs. It’s hooks like these that start as little humble ornaments, only to grow and take over a whole track. This doesn’t happen on Sou, for their mollifying iridescence is perfectly embedded in-between the little alcoves which occur due to the wave-like nature of the organ layers. They swell and fall and rise again. Once this particular hook gets quieter and is prepared for a slow fade-out, Celer & Machinefabriek add further curlicues to the mix, and this time they are more akin to the Clicks & Cuts or Microhouse movement than the Glitch formula: gently crackling pulses and artificial wind gusts waft around the nucleus of Sou which then ends on a deep belly-massaging bass drone. In comparison to Hei, this composition is warmer and fuller right from the start, as the churchly texture of the organs allows a glint of opulence to enter this EP, but it doesn’t reach the former’s blissful superstructure of endorphin-firing grandeur. One track has to win, and to my ears, it is Hei, but Sou is intriguing and saccharine as well due to the reduced usage of potentially harsh sound effects. What a great way to end the triptych! Both Hei and Sou are overly positive and swirl in close proximity to the established Pop Ambient formula, but retain the microscopic dissonances and cacophonies of the Glitch and Clicks & Cuts genres without ever succumbing to the rules and conventions of either. Hei/Sou is a proper Ambient duo without distracting beats or convoluted percussion sections. It is all about the shimmering beauty of synthesized structures. Hei is the stronger take in my humble opinion due to its sumptuous qualities, the greater pool of synthetic instruments and the development of various ideas and phases – all in less than five minutes. What sounds like a crammed, overly bustling vignette on the pixels of your reading device is in fact a harmonious, well rounded track, as promised in the track description the duo provides. Sou is a few degrees warmer and at the same time more intimate. It doesn’t depict the open wideness due to its focus on ecclesial structures, the deep bass layers and slowly mendering organ melodies. Both tracks are great examples of vivid Ambient music. Considering the harsher, more intimidating and electrically buzzing realms of Machinefabriek’s latest release Stroomtoon (2012), the cozy synth washes of Hei/Sou are all the more surprising and can successfully be linked to Celer’s anodyne sedative Lightness And Irresponsibility (released in 2012 as well). Together with the stunning artwork and slowly morphing videos by Marco Douma, this is a great final EP and available in all big digital music stores and in a strictly limited 7″ edition of 250 copies. The forthcoming Hei/Sou is the more contemplative of the three releases, and the most abstract. Hei starts with a cymbal-like percussive and then drifts into a gentle sustained keyboard mantra with a wandering background of gentle buzzing and contrasting deep bell-like tones. The cymbals return and are combined with a placid cluster of sound. Sou opens with a Morse-code-like pulse and omnipresent warping tones that gradually combine with a fabric of lightly sequenced rhythms, and there they hang in suspension as the pulsing grows stronger and then fades. Gradually an undertow of deep liquid sound emerges to the foreground and the rhythms are overtaken and then disappear. Created by Celer (Will Long) and Machinefabriek (Rutger Zuydervelt) in Tokyo and Rotterdam in June 2012, Hei / Sou brings to a close the duo’s trilogy of seven-inch collaborations. As with the two previous singles, Maastunnel / Mt. Mitake and Numa / Penarie, the release comes with two videos by Marco Douma and is available in a physical edition of 250 numbered copies (downloads also are available of all three releases). The single’s two pieces are detail-packed microcosms of ambient-drone activity. “Hei” begins with ringing cymbal accents that are quickly joined by burbling synthesizers and electronic atmospheres before the material decompresses to form a becalmed, slow-motion stream of glittering flourishes. Slightly more sedate by comparison, “Sou” scatters micro-flickers of percussive rattlings alongside a central drone until swirls threaten to combust during the piece’s late stages. The video for “Hei” shows an uninterrupted flow of hazy images of sunlight and shadow, with the setting (or rising) sun bleeding through abstract silhouettes formed by what appear to be trees and fences. The treatment for “Sou” adopts a more abstract character, with nary a real-world element displayed within Douma’s blurred scrim of silvery textures and criss-crossing patterns. 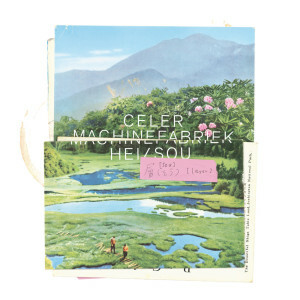 One of the most appealing things about the Celer-Machinefabriek collaboration is that it brings out compelling sides of both participants and broadens out their respective sound-worlds in surprising and unexpected manner. Given that each of the singles totals about ten minutes in duration, one imagines that a full-length CD document of the collaborative project might conceivably pair the three singles with a half-hour piece taken from their live concerts. Regardless, it’d be a shame to see such a fruitful collaboration come to an end with the release of this third single. En ja ook nu komt een Machinefabriek release weer niet alleen. Niet dat ik alles dat uit is gekomen dan heb besproken, maar dat terzijde. Het sluitstuk van de trilogie met Celer, het ambientproject van de Amerikaan Will Long, is nu een feit. De samenwerking start na een optreden en ontmoeting in Tokio in 2010. De serie 7”-es wordt na Maastunnel / Mt. Mitake en Numa / Penarie afgesloten met Hei / Sou, waarop wederom twee tracks staan van bij elkaar ongeveer 10 minuten. Daarnaast krijg je ook weer 2 te downloaden video’s van Marco Douma. De twee tracks bevatten niet zoals de voorgaande singles enkel serene ambient, maar ook wat luidere klanken en ritmischer en speelsere elektronica. Frivool is misschien een stap te ver, maar het neigt er wel naar. Het is een luisterrijk elektronisch bubbelbad in combinatie met filmische muziek en symfonische, droefgeestige klanken. Een prachtige afsluiter van een innemende serie!